Realistic virtual worlds can serve as laboratories for carrying out camera networks research. This unorthodox "Virtual Vision" paradigm advocates developing visually and behaviorally realistic 3D environments to serve the needs of computer vision. Our work on high-level coordination and control in camera networks is a testament to the suitability of virtual vision paradigm for camera networks research. The prerequisite for carrying out virtual vision research is a virtual vision simulator capable of generating synthetic imagery from simulated real-life scenes. Here we present a distributed, customizable virtual vision simulator capable of simulating pedestrian traffic in a variety of 3D environments. Virtual cameras deployed in this synthetic environment generate synthetic imagery—boasting realistic lighting effects, shadows, etc.—using the state-of-the-art computer graphics techniques. Our virtual vision simulator is realized as a collection of modules that communicate with each other over the network. Consequently, we can deploy our simulator over a network of computers, allowing us to simulate much larger networks and much more complex scenes then is otherwise possible. How to get it for your own research? We have released the our virtual vision simulator to the community under GNU General Public License V3.0 in order to support virtual vision and camera networks research. Please feel free to download the code from Github repository and use it for your own research. Please send us bug fixes and improvements, so we may integrate them into the virtual vision simulator. Notice that if you want to use parts of our code in a commercial product they will need to comply with the GPLv3 license (all derived products are required to be open source). Thanks to (annevanrossum@gmail.com) for helping us with the above wording. Instructions about how to download, install and use our virtual vision simulator are provided below. We purchased pedestrian models (textures and motion capture data) from aXYZ Design, which hold the copyright to the pedestrian models. Licensing prevents us from distributing these models. You will have to purchase these models for our simulator to work properly. If you are brave you may be able to use your own pedestrian models to work with our simulator. The simulator simply needs a textured human with animation data. If you plan to use your own pedestrian models, let us know. Time permitting we might be able to work together to get things rolling. Please cite the following publications when using our simulator for research. Thank you! "Smart Camera Networks in Virtual Reality," F.Z. Qureshi, D. Terzopoulos, Proceedings of the IEEE, 96(10), October, 2008, 1640—1656, (Special Issue on "Smart Cameras"). "Software laboratory for camera networks research," W. Starzyk, F.Z. Qureshi, IEEE Journal on Emerging and Selected Topics in Circuits and Systems (special issue on "Computational and Smart Cameras), vol. 3, iss. 2, pp. 284-293, 2013. This simulator is introduced in the following publications. We used the current simulator to carry out camera networks research, which lead to the following two publications. "Learning Proactive Control Strategies for PTZ Cameras,'' F.Z. Qureshi, W. Starzyk, Proc. 5th ACM/IEEE International Conference on Distributed Smart Cameras (ICDSC 11), Ghent, Belgium, August, 2011, 1—6. "Multitasking Smart Cameras for Intelligent Video Surveillance Systems,'' W. Starzyk, F.Z. Qureshi, Proc. 8th IEEE International Conference on Advanced Video and Signal-Based Surveillance (AVSS 11), Klagenfurt, Austria, August, 2011, 1—6. Get the code from https://github.com/vclab/virtual-vision-simulator. Install all of the libraries provided in the depenencies/windows folder. Make sure you install Panda3D first. Copy cv.lib and cv.pyd from the OPENCV_DIR\Python2.6\Lib\site-packages\ directory to the PANDA3D_DIR\python\Lib\site-packages\ directory. All of the provided applications are located in the src folder. Execute: python 3D_Simulator.py [options] Where options are the options listed below. NOTE: specifying a configuration directory is mandatory. A screenshot of our sample client which gives a user control over a camera. Please see the Getting Started Guide for step by step instructions on how to use our Virtual Vision Simulator. A scenario is made up of three config files which allow you to configure the scene, the cameras and the pedestrians. These three files must be called scene.xml, cameras.xml and pedestrians.xml and must be placed in a single folder which can be specified using the -d flag. The scene.xml file is used to configure the 3D models and lights that make up the scene. A sample is provided below. has_lighting: Set to 1 if the model is affected by lighting. Our simulator supports three types of lights: ambient, directional and spotlight. pitch: The pitch of the light in degrees. The default is -90. The cameras.xml file is used to configure the cameras. The sample provided below shows all of the options that are currently available. Most of these options should be self explanatory however, we would like to point out that the id of each camera must be unique and the default_direction is the direction the camera faces when the pan and tilt values are 0. The pedestrians.xml file is used to configure all of the pedestrians and their trajectories. Additionally, you can use the start_time attribute to specify when the pedestrian will start executing its list of commands. Our simulator allows researchers to write their own clients which can get images from cameras and tune their parameters using a light weight packet structure. The messages that a custom client can send and receive are provided below. Please see sample_client.py to see how these messages can be implemented. 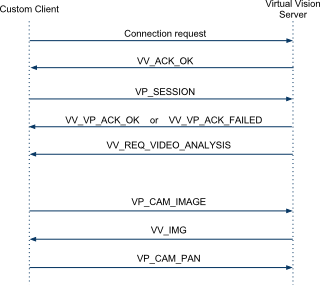 Before a custom client can begin to control a camera, it must first complete the connection handshake shown in the diagram bellow. Once connected, the custom client will automatically be assigned a camera. 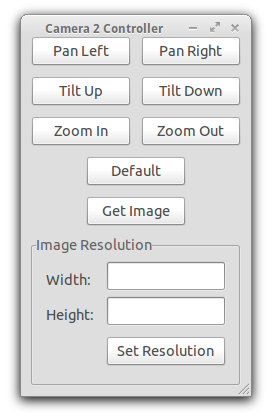 If a camera of the specified type is not available, the connection will fail. We would like to thank Adam Domurad for his contributions to the Visual Processing Client which allowed us to test our simulator with a real pedestrian tracker.